Am I Hungry? 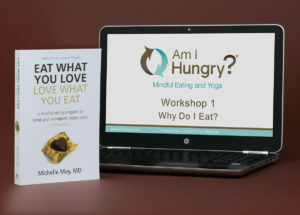 Mindful Eating and Yoga Online Class - Am I Hungry?Am I Hungry? The Am I Hungry? Mindful Eating and Yoga Program is for you if you want to explore the life-changing principles of mindful eating and experience yoga practices that help you embody what you are learning. Do you feel disconnected from your body? Do you define food as “good” or “bad” – and yourself as good or bad depending on what you ate? Mindful eating—eating with intention and attention—provides a practical, universal approach to decision-making without restriction, deprivation, or guilt. Yoga is a wonderful complement to the practice of mindful eating because simply put, practicing yoga is the art of listening to yourself. This Am I Hungry? Mindful Eating and Yoga Online Class will teach you life-changing mindful eating principles and skills. You’ll also experience yoga practices to help you embody what you are learning. Whether you are new to yoga, an experienced yogi, or even a yoga teacher, please join us to discover how mindful eating and yoga can transform your relationship with food and your body! 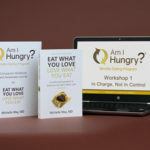 Eight 60-minute webinars facilitated by Am I Hungry? creator and founder, Michelle May, M.D. These are available to you online and can be accessed anywhere, anytime. 16 60-minute yoga practices on video; you’ll have two classes for each of the eight mindful eating workshops. These yoga classes were designed and taught by Am I Hungry? 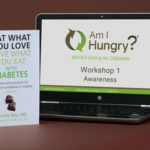 Licensees, Jessie Dwiggins and Dawn Hopkins and embody essential mindful eating concepts. 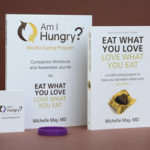 Autographed copy of Eat What You Love, Love What You Eat: A Mindful Eating Program to Break Your Eat-Repent-Repeat Cycle – the award-winning book by Michelle May, M.D. Password access to our private Member Portal – Write in your private journal, access our Am I Hungry? 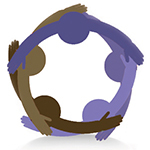 Virtual Coach, and use other great tools.